Легкий самолет Wyandotte Pup был спроектирован Ноэлем Хокадэем и построен в качестве студенческого проекта учащимися канзасской средней школы старших классов "Wyandotte High School". Самолет настолько заинтересовал компанию "Porterfield Aircraft Corporation" ДальшеMore>>> (также из города Канзас-Сити), что она выкупила права на него. На основе Wyandotte Pup в 1935 году нанятый компанией Ноэль Хокадэй спроектировал другой самолет, получивший обозначение Porterfield Model 35 Flyabout. Новый самолет представлял собой моноплан с высокорасположенным подкосным крылом, кабиной на двух человек, неубирающимся шасси с хвостовым костылем и звездообразным двигателем LeBlond 5D мощностью 60 л. с. (45 кВт). В 1937 году на самолет установили двигатель LeBlond 5DE мощностью 70 л. с., он получил новое обозначение Model 35-70 Flyabout. Позже появились и другие варианты машины: Model 35-V с двигателем Velie M-5 мощностью 65 л. с.; Model 35-W, известная также как De Luxe Sport или Model 90, со звездообразным двигателем Warner Scarab Junior мощностью 90 л.с. Всего выпущено 250 самолетов, часть пошла на экспорт. Flying the Porterfield "70": A Tandem-seater Cabin Monoplane Which Cruises at 100 m.p.h. on 70 h.p. DESPITE the increasing popularity of side-by-side seating for both luxury touring and training, the tandem arrangement still has a very great deal to recommend it. Apart altogether from the desirability of complete control freedom, the lone pilot can be provided with a "both sides" view which is very pleasant and useful near a crowded aerodrome or when flying in bad weather. In the American Porterfield monoplane, the agency for which, in Western Europe, has recently been acquired by Sumy Flying Services, the seats are arranged in tandem and, more important, the machine may be flown solo from either - suggesting that, as a stepping stone from a standard trainer to a cabin machine, it might lie very useful. The view from the front seat (the only one I tried) is fair to good, though, until one has spent several hours in a particular machine, judgment on this point is somewhat premature. During a turn a high wing comes down to cover that part of the earth which, especially during an approach to land, the pilot most ardently desires to see; in the Porterfield it is possible to put one's head, so to speak inside the deeply curved screen and to see what would otherwise be cut off. With such an expanse of deep window in a high-wing monoplane the view of the ground in level flight is everything that one would expect. In cruising attitude the top of the engine cowling lies decently below the level of the horizon and only while taxying does the nose impede vision - a fault to which all single-engined machines are prone. The left-hand windows may be opened for ventilation or for landing in rain. As a flying machine the Porterfield, though small and light, is still typically American, with a light rudder and somewhat heavy ailerons. Much of this apparent heaviness is caused by stiffness in the control operation itself, and the ailerons are certainly effective right down to the stall. In any case, the machine is virtually without vice and sits about the sky at all speeds as if hung from a cord. Let everything go in a tight turn and it yaws its way back to level; hold the stick right back and the machine merely wallows momentarily before dropping its nose and repeating the process. A steep sideslip can be held, using full rudder, without an increase in speed, though a crab sideslip provides the most effective method of losing height. The landing process, with a somewhat heavy elevator movement, should be almost foolproof. The only control criticism worth mentioning concerns the position of the trimming lever, which is arranged on the left side behind the front seat so that it can be used by either occupant. Its somewhat awkward placing would be of small account if it did not, in addition, require an excessive number of turns - though the machine, even when flown from the front, can be held up comfortably in the glide without alteration of trim. The heel brake pedals, which are duplicated, are easily used with accuracy after a little practice. Since neither the A.S.I, nor the altimeter were working properly at the time of the trial, no first-hand performance figures can be given, but the take-off run given in the table is certainly not optimistic. I flew the Porterfield both solo and otherwise, and in a moderate breeze the machine was comfortably air-borne in rather less than a hundred yards, provided that it was pulled off the ground. The price includes all the usual instruments, including a compass, and navigation lights and battery can be fitted for ?10 if ordered with the machine. Accommodation for luggage is provided in a locker at the rear of the cabin. Rate of climb (full load) 600ft./min. Distributors Surrey Flying Services, Ltd., Airport of London, Croydon, Surrey. 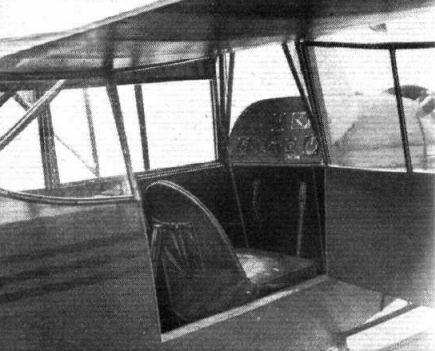 The Porterfield 35 Two-seat Light Cabin Monoplane (70 h.p. Le Blond engine). The general layout of the Porterfield "70" and the pilot's range of view are adequately shown in this Flight photograph of the machine flying near Croydon. ANOTHER INVADER: The agency for this machine, the American Porterfield 70, has been obtained by Surrey Flying Services. With a 70 h.p. Le Blond engine this tandem-seater cabin monoplane cruises at 105 m.p.h. and will cost ?625 over here. Porterfield Model 35 Flyabout выпускался в вариантах с различными двигателями. На фотографии - Model 35-W-90 с двигателем Warner Scarab Junior мощностью 90 л. с. 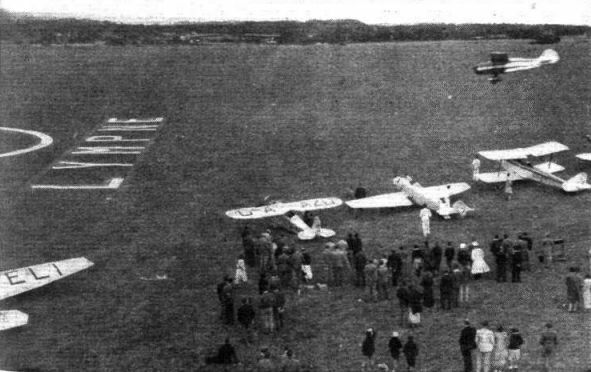 Between heats and final mechanics tinkered, while spectators watched demonstrations of the Wicko, seen flying above, the Porterfield "70" and the German Fieseler with 70 h.p. Hirth engine. The cabin and front seat of the tandem-seater Porterfield monoplane, which cruises at 100 m.p.h. on a 70 h.p. Le Blond radial.